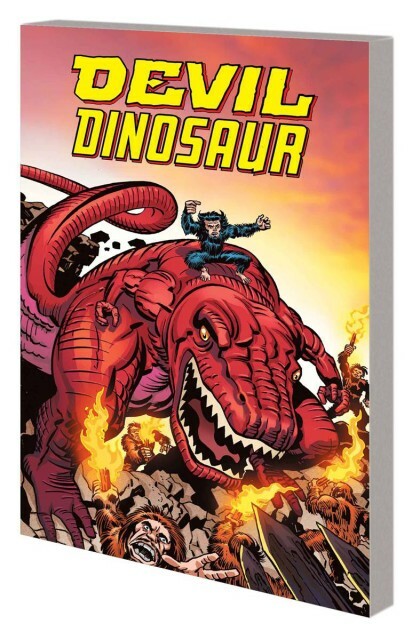 ANDY’S PICK :: DEVIL DINOSAUR BY JACK KIRBY THE COMPLETE SERIES TP: Here’s the back-story. In 1972, DC asked Jack Kirby to come up with a title to compete with Marvel’s recent licensing acquisition of Planet of the Apes. Hence, Kamandi. A few years later, Kirby was back at Marvel and they asked him to create a new property that could go paw to paw with the new Kamandi TV series that DC was developing. So Kirby grudgingly came up with Devil Dinosaur and Moon Boy. The series only ran for 9 issues. The comic was geared at younger readers, but like most comics back in the ’70s it was never marketed properly. So, at the time DD looked like a big-foot n embarrassment from the once-great King when compared to the more cutting edge ‘relevant’ comics from O’Neill and Engelhart. Today those topical books are still fun but are self important, quite silly and rather dated; meanwhile ol’ DD remains a great kids comic just brimming with the Kirby excitement, movement and creativity. Marvel is offering all nine issues in an affordable soft cover edition for only 19.95. You owe it to yourself to pick it up and enjoy! ← HEROESCON 2014 GUEST LIST UPDATE :: MCKONE! NILES! ROUX! & MORE!